Chris Curran: Growth Igniters Radio, Episode 52. Leadership Secrets of a World Class Franchisor. This episode is brought to you by Business Advancement Incorporated − enabling successful leaders and companies to accelerate to their next level of growth. On the web, at www.businessadvance.com. And now, here’s Pam and Scott! Pam Harper: Thanks Chris. I’m Pam Harper, Founding Partner and CEO of Business Advancement Incorporated, and right across from me is my business partner and husband, Scott Harper. Hi Scott. Scott Harper: Hi Pam. As always, I’m so happy to be here with you for another episode of Growth Igniters Radio − and if this is your first time listening, our purpose is to spark new insights, inspiration and immediately useful ideas for leaders to take themselves and their companies to their next level of success. So Pam, what are we talking about today? Pam Harper: The leadership secrets of a world class Franchisor. Scott Harper: Secrets… Okay, I like that. Scott Harper: Well that’s right, and in fact, we’ve read recently that the franchise sector is projected to grow at a significantly higher rate than the general economy this year. Pam Harper: That’s right. But what does it take to come up with an idea for a franchise that can be successful and what does it take to lead this type of company, so it becomes a dominant player in it’s industry? Scott Harper: Okay − two different things. Pam Harper: Well, to answer those questions and more, we’re delighted to have as our guest today, Brian Scudamore, Founder and CEO of O2E Brands, which is the banner company for 1-800 GOT JUNK, Wow 1 Day Painting, You Move Me, and Shack Shine. Now, Brian actually started out with one truck and a great idea, and that became 1-800 GOT JUNK, which has become one of North America’s most successful companies. It’s now a household brand name and a major player in three countries. He’s poised to do the same with his three other brands, and Brian and his companies have received widespread recognition in the media and business community. This includes being named entrepreneur of the year by the International Franchise Association. He’s been featured on CNN, ABC Nightline, Undercover Boss and Oprah, and has shared his impressive story in Fortune Magazine, New York Times, The Wall Street Journal − and that’s just to name a few. Pam Harper: Yes. A recognized thought leader who recently coined a modern, relevant term for franchising, which is “Entrypreneurship”, Brian is a frequent contributor to publications including Forbes, Profit and The Globe and Mail’s Leadership Lab. You can learn much more by going to www.growthignitersradio.com, episode 52. Brian, welcome to Growth Igniters Radio. Brian Scudamore: Well thank you for having me. It’s an honor to be on your program, and with the build up there, I’m honored. You sound like you share the same passion for entrepreneurship and franchising, that I do. I’m so excited to talk to your audience today. Pam Harper: You bet. It seems especially appropriate to be talking about franchising, as we’re coming up in this new year of 2016, and it’s something that I think is going to happen a lot more. There are going to be more people out there who are thinking about this. We’d love to learn a little bit about you. What was it about the vision that drove you to create, not just one highly successful global franchise brand, but four? Brian Scudamore: It started with a vision to pay for college. I was one course short of graduation from high school; I was at a McDonald’s drive through and saw a beat up old pickup truck with plywood side panels on the box. It was filled with junk, and it said “Mark’s Hauling” on the side. I went out and bought myself a pickup truck and started hauling junk. Five years later I dropped out of University, I dropped out of college because I was learning more about business by running a business versus studying in school. Brian Scudamore: I spent the next 20 years building up a really successful company under the brand 1-800 GOT JUNK. I had so much fun, brought so many great people into the business − we had great success, 100 million dollars in revenue at the time, throughout Canada, the United States and Australia − that I said, maybe there’s an opportunity to leverage everything we’ve done well, marketing, PR, booking and dispatch for our franchise partners, the whole franchise space, finding great people. With the success we had in 1-800 GOT JUNK, we thought, well if we can build a hundred million dollar company in the junk removal space through franchising, why couldn’t we get into other equally fragmented spaces? Painting with Wow 1 Day Painting, moving, Shack Shine, which is our newest brand, our newest baby so to speak, which is windows, gutters, power washing. It’s the house detailing space. We’ve been able to take these great businesses and build out a brand in other fragmented markets, and today we’re a quarter of a billion dollars in revenue, with a goal to get to a billion by 2021. Ambitious goals, but we will do it because of the amazing people that we’ve been recruiting. Pam Harper: That’s pretty exciting. Had you always known about franchising − was that something that you naturally thought about, once you got going − or was that something that was suggested to you? Brian Scudamore: As a kid, I’d always had an entrepreneurial spirit. I learned about entrepreneurship from my grandparents, who had an Army surplus store in San Francisco, where I was born and raised. I used to go work in their surplus store, and loved the game of business. One of the businesses that I used to really love as a model was McDonald’s. As a kid I loved McDonald’s − I certainly enjoyed the food and everything they were about − but I certainly found that I also liked what Ray Kroc had built, in terms of a business model of franchising; taking a business system and scaling it through great people, his franchisees. Scott Harper: Now, one of the things that’s really intrigued us Brian, is that we’ve read that many people said that franchising the junk business was just not possible. It was impossible, you couldn’t do it − but you went ahead and did it. What let you… what led you to break through all those barriers and really redefine the whole industry, and come up to the lead of it? Brian Scudamore: Yeah, that’s a great question, Scott. I met with a whole ton of different franchise experts, people that were experienced in the industry. I met with about a dozen of them. One of them was a Senior VP at McDonald’s and they all said, it couldn’t be franchised. I don’t know if they just meant that I couldn’t franchise it, or that really the space would never work. The reason I was hearing from them was, what would stop someone from buying a pickup truck of their own and starting their own junk removal business − hauling junk, knocking on doors − like I did in the early days. I started to look at the industry and I took all their feedback and made a list of objections, if you will. I went back to the drawing board and I re-tooled the model, and I said okay, what if I could do all the booking and dispatch for our franchise owners, so that they could drive sales? We set up a software system, a call center, so that we could make all that a reality. What if we could build a national brand? 1-800 GOT JUNK wouldn’t just be in Vancouver where we started, but in the top hundred metros throughout North America. What if we could build this brand that, the power was behind all of us working together? If we got on the Oprah Winfrey show, as we did, everyone benefited from that free press, so we got out there and drove the brand hard. That model, when I went back to some of the people that said, “no this can’t be franchised,” they said, “Wow, if you’re doing the booking and dispatch, you’re putting the training systems in place, you’re creating the National brand,” they said “yeah, maybe you’re onto something.” We’re in a highly fragmented service industry that doesn’t have a high level of service, and I proved that what they thought was impossible, was actually possible. It’s funny, because there’s a quote on one of our walls in our office by Walt Disney, and it says, “It’s kind of fun to do the impossible.” One of my favorite things in the world to do as an entrepreneur is, tell me “no.” Tell me why something can’t be done, and I’ll figure out a way to make it happen. Scott Harper: It sounds like what you did was you looked at the business, and you really identified key differentiators that would set you apart in a business model, and also in attracting customers. That really took it to a whole new level. Brian Scudamore: Yeah. Service makes the world go ’round, and if you can really treat people right, find the right people as employees who get [the idea of] customer experience, and know how to take care of people, it’s amazing what you can accomplish. Brian Scudamore: Ordinary to Exceptional. Brian Scudamore: Yeah. Ordinary to Exceptional − O2E Brands. Now, what that is all about, where that came from is, my accountant at the time came to me and said, “We have this numbered company, this parent company for all the brands; we should give it a name.” And I thought for about 6 seconds, and I said, “Well, if you think about what our business is about, it’s about making the ordinary exceptional through customer experience,” so we said, why not call it O2E Brands? Everything we do, the junk removal business − we took an ordinary fragmented mom and pop business that was just filled with beat up old pickup trucks like I started with, and we made it exceptional. We created the Fed Ex of junk removal − that was always the goal − clean shiny trucks, friendly uniformed drivers, on-time service, up-front rates, and we’re doing the same thing in other fragmented spaces. “O2E” seemed very fitting. Pam Harper: It sounds like it really guides a lot of the types of brands that you choose to grow, is that right? Brian Scudamore: It guides everything. We would not buy, start, acquire an industry, a business that wasn’t already ordinary and didn’t have great potential to become exceptional. If there was a business that we saw an opportunity where the business was already exceptional and we could make it slightly better, that’s not quite as exciting. We want to take something where the bar is low and really jack it up. If I think of it guiding our decisions, when someone walks into our head office, which we call the “Junktion,” with a k − Junktion − If someone comes into the office space, there’s this line on the ground, this big vinyl decal, and on one side it says “ordinary,” and on the other side it says” exceptional,” so it’s a reminder to our people, to our guests − anyone that comes into our space, it’s like you are about to cross the line from ordinary into exceptional. We have fun with everything we do and we expect people to have an exceptional mindset. We expect people to hold the bar high and make great things happen. 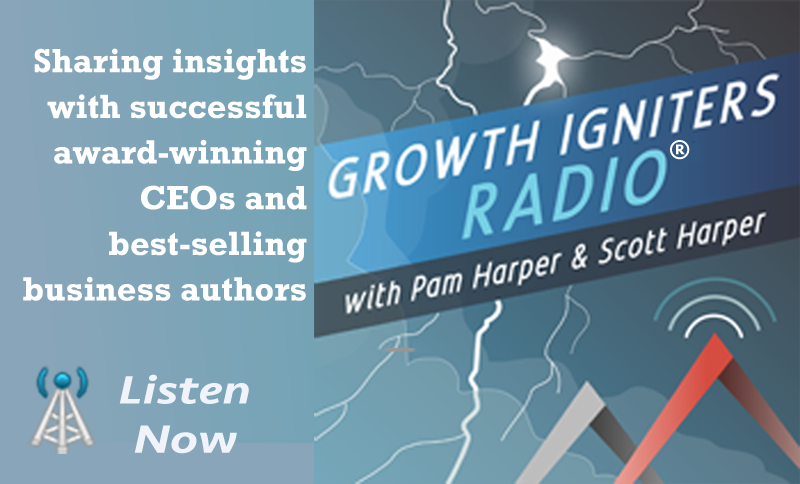 Scott Harper: You are listening to Growth Igniters Radio, with Pam Harper and Scott Harper. Brought to you by Business Advancement Incorporated. On the web at www.businessadvance.com. We enable successful companies to accelerate to their next level of innovation and growth, and if you like what you’re hearing, spread the good word! Go to www.growthignitersradio.com, select episode 52, and use the share links for Facebook, LinkedIn and Twitter at the top right of the page to tell your social media communities all about us. While you’re there, sign up for our weekly alert of upcoming episodes, so you’ll always be up to date. Pam Harper: Welcome back to Growth Igniters Radio with Pam Harper − that’s me − and Scott Harper. Scott and I are talking today with Brian Scudamore, founder and CEO of O2E Brands, the banner company for 1-800 GOT JUNK, Wow 1 Day Painting, You Move Me, and Shack Shine. Brian, how can people find out more about you and your brands? Brian Scudamore: Well the easiest way is to go to www.O2E Brands.com, or they can Google me, Brian Scudamore, and you’ll find my LinkedIn contact information, my Twitter information. I love what I do, and I’m happy to share stories and ideas with people who I meet. Pam Harper: We appreciate you sharing with our listeners. You can also access all of this by visiting www.growthignitersradio.com, episode 52, and you’ll see links to everything that we’ve been talking about today. So let’s get back to our conversation. We’re now talking about leading this amazing company. How has your philosophy about leadership evolved as you’ve gone from leading a single business to leading a corporate entity that’s actually made up of multiple businesses? Brian Scudamore: My philosophy − I had a big turning point in my career, the biggest one I think I’ve ever had, where my philosophy suddenly changed, and from that point on has remained the same. That point was in 1994, five years into my business. I had eleven employees, and these eleven employees I had were not the right people. They weren’t my type of people. I had nine bad apples and maybe a couple okay ones, but one bad apple spoils the whole bunch. I took those eleven employees, brought them in a room one day and decided I was done. I decided I had to make a change and I fired every employee in my company. All eleven people, I said to them − and I fired them at the same time − and I said, “I’ve let you down as a leader.” I’ve either not found the right people, given you the love and the training and the support you need, I haven’t spent time connecting with you, and I’m sorry but, I don’t think I have any other options but to start again, and this was my fault.” From that day, I developed a philosophy, and it’s posted at the Junktion, right up on the big wall, if someone comes into our office; it says “It’s all about people,” with my name below it. It’s my commitment and our commitment as a company, or even a group of brands, to find the right people and to treat those people right. It’s a philosophy that’s a simple one, but it’s served us well. We’re very, very careful to find the right people; we’re slow to hire, we’re quick to fire if something really isn’t working out and we’ve given someone the chance to fix things, and given them the direction and support. We really do have a culture here which is second to none. People walk through our space and they look around − it’s open, it’s transparent, there’s no private offices, not for myself nor my president. They look around and they go, “Wow, this is something special,” and I have to agree. We’ve got special people working here and that’s made all the difference. Pam Harper: We like that. Scott Harper: That really grabbed us, and it sounds like that embodies that philosophy − so how do you interpret that? Why do you like rebels, and how do they contribute to your success? Brian Scudamore: We just like people that don’t take “no” for an answer, that can find a way to make the impossible… possible. We like people that push boundaries. We like people that take the road less traveled and do things differently. I was always as a kid told, “You can’t do this, you can’t do that,” and I’d find a better way. Sometimes you’ve got to think outside the box and be so far outside the box, that you come up with some innovative way to do something, like buying a pickup truck and changing an industry, and so we teach our people to be entry-preneurs − to find their own entry point into the world of entrepreneurship. That’s what O2E Brands is all about, is empowering exceptional entrepreneurship and we have fun every single day. Even when things are tough, even when things are too busy, I’ve got to feel like people around here are still having a good time. Pam Harper: Well, that brings to mind another question, which is what particular aspects of your culture − you’ve talked about Entrypreneurship and rebels − what particular aspects of your culture are especially important to O2E’s success now, and as you visualize it going into the future? Brian Scudamore: It’s people caring about other people. People in the O2E family − we support and help one another, so it’s not uncommon, in fact it’s a daily occurrence that you hear stories or see examples of franchise partners of ours helping their neighboring franchise partner. People help their peers. The reason why I love franchising so much is, you’ve got this network of great people, all these brilliant minds working together, that people come up with ideas and they share them with one another to help support each other through challenging times. We had one of our partners who had a stroke, and every single person surrounding that franchise − all the franchise partners got together and took over his business to help him through that time, when he needed to physically heal and until he could get back on his feet. Caring, I think, is a very important part of our culture. Brian Scudamore: Innovation, taking the road less traveled and thinking differently. We don’t want someone to say, “This is what everybody’s doing and we’re following.” We’re leaders. The rebel side − that little line that has gotten a lot of attention, which was just written very casually − it’s about someone who goes, “You know what, I’m attracted to the fact that this company does things differently and that they’re perpetually looking for a better way.” Having fun − we have a ton of fun in everything we do. You spend too much time at work, to not enjoy yourselves. We take that philosophy of, work hard, play harder and it’s having fun together. Brian Scudamore: For some. And you know, everyone’s got their way of doing things. Our way − which we’re not saying is the right way for everyone, but it’s the right way for us − we love what we do. It shines through and through in everything we do. People see it, they can see the passion for the businesses and the people we’re building and developing. I think as long as you find your passion in life and that you can really share it with others, that’s one of the big keys to success. Pam Harper: Definitely. So we’re going to take another quick break right now, and when we come back, we’ll talk more with Brian Scudamore, Founder and CEO of O2E Brands, about some immediately useful ideas for successfully building a rapidly going company… or four, for that matter! Stay with us. Scott Harper: So Pam, can you tell our listeners why clients engage us to speak at events, conferences and company off-sites? Pam Harper: Well, they’re seeking new insights for dramatically accelerating company transformation and growth, and they’re also seeking new leadership insights about themselves, their teams and their organizations, so they can make bold new decisions about strategy and implementation. It’s been especially rewarding to find out that some of our company off-sites have actually resulted in breakthrough decisions that have generated as much as ten fold growth over 5 years, and that is exciting. Scott Harper: That is exciting. So contact us today, at www.businessadvance.com to arrange for a brief call to discuss your needs and options for helping you achieve your most important goals. Pam Harper: Welcome back to Growth Igniters Radio with Pam Harper and Scott Harper. Over the last 2 segments, Scott and I have been talking with Brian Scudamore, Founder and CEO of O2E Brands, the banner company for 1-800-GOT JUNK, Wow 1 Day Painting, You Move Me, and Shack Shine, about the lessons he’s learned about building and leading a family of highly successful franchise brands. Brian, can you tell us again how people can contact you, or O2E Brands? Brian Scudamore: Sure, they can learn more about O2E Brands and hear more about the story on www.O2EBrands.com. They could get in touch with me; I’m highly engaged on Twitter. My Twitter handle is @brianscudamore, and LinkedIn is also a great place. We’re a connected world. It’s easy to reach people these days. Pam Harper: Oh, it is. It definitely is. Now, we are at the part of our episode where we really like to focus in on the immediately useful kinds of things that leaders can use to grow their companies. What would you say would be the first thing? Brian Scudamore: The first thing that I always love to tell other entrepreneurs is, make sure you have a clear vision. You don’t need to know how to get there; in fact you want to specifically keep your focus away from how you’re going to get there, you just want to know where you’re going. For me, vision is the “painted picture.” It’s a clear picture of what it looks like − the destination. If you think five years out in your own business life and the business world as an entrepreneur, what does your company look like? If I think of O2E Brands five years out, we will be a billion dollar business, we will have 10 brands, all in the home services space. The detail of the culture, who we are, how we act; what we represent, that’s all clear in that picture. Then I rally a team of people to help us figure out how we’re going to make that happen. I’m the visionary, the culture guy, and I surround myself with executors who can take that picture and translate it into action. So have a vision, have a painted picture for your business. It’s absolutely key. Scott Harper: We completely agree with that. And what’s interesting about O2E Brands is, you’re a company of companies. Within each franchise brand, there are the franchise companies − so how do you roll out the visionary practices, the idea of vision, across all this very diverse group of people who are running all these businesses? Brian Scudamore: Yeah. Many channels, and many ways that we do that. It always starts with taking the painted picture and sharing it at our franchise kick-off, our annual meeting where all brands and all people come together, and I get up on stage and read it, and say here’s our vision. Here is the vision for 1-800-GOT JUNK, or if I’m speaking to the Wow 1 Day crew, I’ll talk to the Wow 1 Day Painting company and say, “Listen, as franchise owners this is what we’re building,” and I’ll read them their painted picture. A painted picture is paramount, and it really spells out for everybody where we’re going. It gets everybody aligned very quickly. If people aren’t excited about it − we’ve had people leave the company. But the people that are excited about it, say, “Yes. Brian and company, we see what you guys see,” and then they become a key part of making it all happen. Pam Harper: Now, I understand Brian, that you have something called a mini-vision? That everybody has their own vision? Brian Scudamore: Well, we try and get people to come up with a departmental vision, or a vision for themselves. What do they want to accomplish within our family of brands? I think vision starts at the top, but then it works it’s way down to each and every person in the entire business to challenge themselves with, what do they want to accomplish? Pam Harper: They actually have their own painted picture within? Brian Scudamore: Not everybody has created it, but we try and challenge people to come up with their own vision. We try and challenge people to come up with their own personal goals, so we’ve actually got a program called 101 Life Goals. Most people in the business have actually inputted into our app, 101 life goals, things that they want to accomplish, dreams that they want to make happen, that they think the business, or people in the business can help them turn into reality. Pam Harper: Okay, so what’s another immediately useful idea that somebody can finish listening to right now and go back and put it right to work? Brian Scudamore: Yeah. Another one is, read The E-Myth, and The E-Myth Revisited ,by Michael Gerber. Scott Harper: It’s right up here on our book case. Brian Scudamore: Yeah, we have stacks of them here, and when people come into the office, if they haven’t read it, we give it to them. Outsiders will come in for a meeting and we’ll say, “Have you read the book? Well, here you go.” Hugely impactful business book. I’ve gotten to know Michael Gerber over the years, and we love systematization, taking things that might be broken and going, what’s the opportunity here to systematize this, so that the same problem never happens again? Pam Harper: Systems are a very important thing, especially when you’re talking about being able to replicate success across the world. Brian Scudamore: Exactly. And if I had to come up with a third one, there are three things I like to talk about − vision, people and systems. We covered the systems with The E-Myth, and we covered vision with the painted picture. On the people side, it’s just do you really have the right people and are you treating them right? Treating people right, what does that mean to you? Really going through your own brain and saying as a leader, what is treating people right? For us it was five weeks paid vacation, we increased the level of vacation across the company, because we wanted people to work hard and play harder. We created a profit sharing program, so that we could share profits with the people in the business, provided we hit our goals. Just generally recruiting people, we really focus on bringing the right people into the business. There are lots of recruiting tools that we have as a business that are all e-myth-ed of course, where we can bring the right people in and make sure we treat them right. When you do that and you succeed, I take a look at our business and I feel so blessed and lucky that we have the people that we have here. Our hard work has really shown itself. Pam Harper: That’s wonderful. It has been really great to talk with you about all of this. Are there any final thoughts you’d like to leave our listeners with on the topic of being a leader of a world class franchise? Brian Scudamore: I just love what I do, and I think I said this before, but it’s worth repeating; if you find your passion and you have a clear picture of what your vision is, getting there becomes easy. It’s not always easy work, but it somehow just becomes smooth, and things just come together. If you’ve got the right motivation to get to your passion and find the right people who believe in that same vision or passion that you’ve got, like Walt Disney, it becomes fun to do the impossible. I found that so many things that we’ve planned on doing and made happen, others told us they would be impossible, yet we’ve proven we can do them. Pam Harper: You definitely have. Well, thank you so much Brian, for being our guest on Growth Igniters Radio. Brian Scudamore: I enjoyed my time. Thank you to both of you. Scott Harper: Brian, it’s been great. And thanks to you out there for listening to Growth Igniters Radio with Pam Harper and Scott Harper. To check out resources related to today’s conversation, share on social media, find out about upcoming episodes, read the transcript for this episode, or open a conversation with us, go to www.growthignitersradio.com and select episode 52. Scott Harper: What can you do to challenge conventional wisdoms of your industry and redefine what can be done? Chris Curran: Growth Igniters and Growth Igniters Radio are service marks of Business Advancement Incorporated. All Growth Igniters Radio episodes are copyrighted productions of Business Advancement Incorporated, intended for the private use of our audience. Except as otherwise provided by copyright law, all other uses including copying, editing, redistribution and publication without prior written consent of Business Advancement Incorporated are all prohibited. All rights reserved. Opinions expressed by our guests are theirs alone, and do not necessarily reflect those of Business Advancement Inc.